Ronstan V-Cleats™ are simple yet effective rope cleating devices. Manufactured from PTFE impregnated, glass and carbon fibre reinforced composite material they are lightweight. Computer generated tooth geometry provides a positive, self-cleating action on the line. 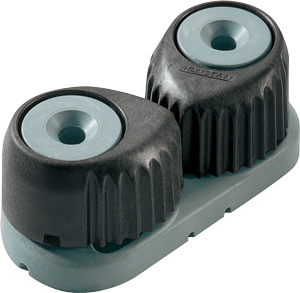 For applications where constant line draw-through is required, the opening action of Ronstan cam cleats are recommended. 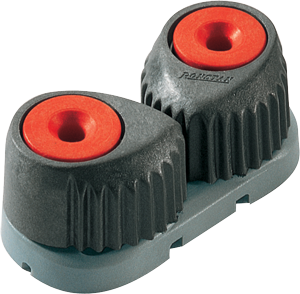 T-Cleats™ have har wearing glass fibre reinforced cams for reliable cleating. They offer a great value solution for moderately demanding applications. Computer optimised Cam profile results in superior gripping ability over a wide range of rope sizes. A comprehensive range of specialist cleat accessories allow customisation of the cleat set-up to optimise performance by controlling inward rope lead, outward rope lead, cleating and uncleating angle and height. Low entry and exit efforts due to unique teeth and entry profiles. C-Cleats™ feature lightweight , ultra-rigid carbon fibre reinforced composite cams that are corrosion free, wear resistant and non-abrasive. 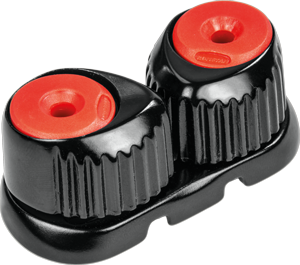 Alloy cam cleat models are built for ultimate durability where high wear and high loads are encountered. Cams are hot-forged and hard anodised for maximum strength and corrosion resistance. 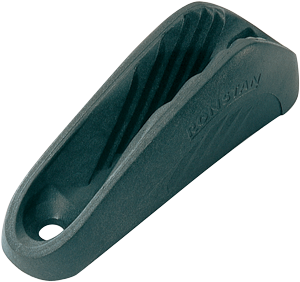 Ronstan Alloy Cam Cleat models are available in small and medium sizes. The medium cleat is built on an aluminium base for maximum rigidity whilst the small cleat has a composite base for an optimum blend of lightness and durability. Hard anodized aluminium cams for highest resistance to heat and wear. The gloss anodized finish also provides lowest line entry and exit effort. The SMALL Alloy Cam Cleat is built on a long strand glass fibre reinforced polymer base and the MEDIUM Alloy Cam Cleat is built on a hard anodized aluminium base.